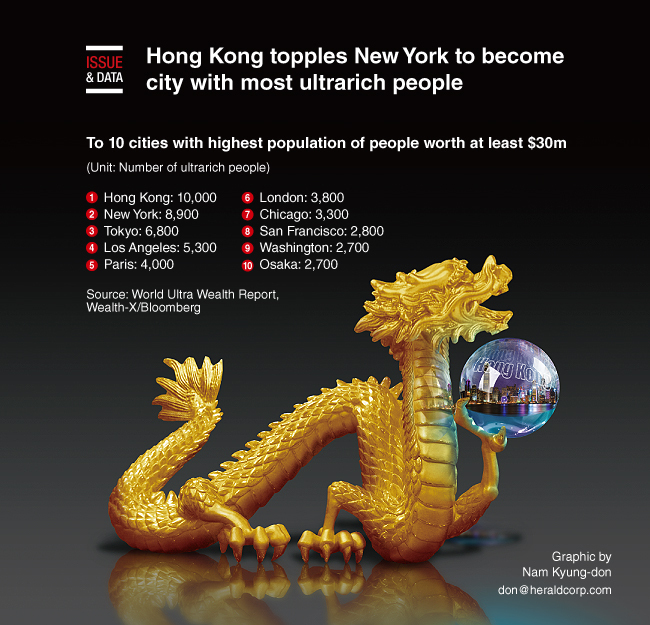 New York is no longer home to the biggest number of ultrarich people, as it has been overtaken by the rising tide of wealth in Asia. Hong Kong has surpassed the Big Apple as the city with the highest population of people worth at least $30 million, according to a new report. Research firm Wealth-X found that the number of ultrarich people in the former British colony increased 31 percent last year to reach about 10,000, higher than the nearly 9,000-strong ultrarich population of the US’ largest city. Tokyo came third, while Paris beat out London to take the European crown as Brexit weighed on the UK capital. The number of ultrarich people worldwide rose 13 percent last year, totaling about 256,000 people with combined assets of $31.5 trillion.